DIRTBLASTER AUTOMATIC POOL CLEANER AUTOMATIC POOL CLEANER? Designed and manufactured by Blue Wave®, DirtBlaster Automatic Pool Cleaner is available in above ground and in ground models. With DirtBlaster Automatic Pool Cleaner™, you gain the same quality as EASY VAC™ and RANGER™ at a terrific price. Say goodbye to the chore of pool vacuuming! With just one moving part, Blue Wave’s® DirtBlaster Automatic Pool Cleaner—a suction-side pool cleaner—grabs dirt, twigs, leaves, and other debris from the pool in one sweeping motion. Because there is only one moving part, DirtBlaster Automatic Pool Cleaner offers years of maintenance-free operation. This pool cleaner is built to last. Simply plug the unit’s hose into the pool skimmer and DirtBlaster Automatic Pool Cleaner masters any cleanup job. 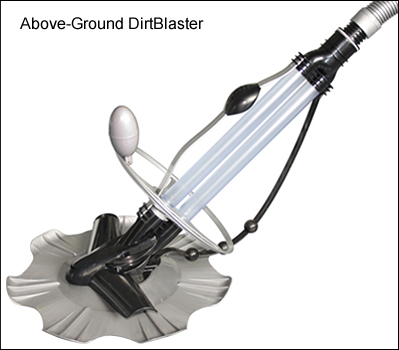 DirtBlaster Automatic Pool Cleaner cleans any pool—regardless of shape or depth; above ground, or in ground. DirtBlaster Automatic Pool Cleaner is quick and easy to install. The Above ground DirtBlaster Automatic Pool Cleaner model comes with 30’ of hose; the In ground DirtBlaster Automatic Pool Cleaner model comes with 40’ of hose. Blue Wave® DirtBlaster Automatic Pool Cleaner comes with a 1-Year Manufacturer Warranty. Why Use DirtBlaster Automatic Pool Cleaner? Swimming pools and spas are meant for fun and relaxation—not work! The best way to enjoy more time in a pool is to ditch the manual vacuum cleaner and invest in an automatic pool cleaner. Why? Automatic pool cleaners consistently spare owners and operators the tedious process of manually vacuuming the pool. Automatic pool cleaners also relieve the cost of hiring a professional for pool cleaning tasks. Much like a home vacuum system, automatic pool cleaners create suction to lift dirt and debris off the bottom of the pool. Automatic pool cleaners can be put in the pool for a few hours to perform lengthy and thorough operation, or just a few minutes a day to maintain clear water. Using an automatic pool cleaner facilitates establishing a regular schedule for cleaning the pool—a task made much more difficult when using time-consuming manual cleaning devices. Blue Wave's Dirt Blaster is available in both above ground and in ground models to cater to every pool owner and operator. Dirt Blaster will clean any pool regardless of shape or depth. It will remove dirt, twigs, leaves and debris from the pool simply and effectively, freeing everyone from the chore of vacuuming. Built to last, DirtBlaster Automatic Pool Cleaner is backed by Blue Wave's one-year warranty. End pool-cleaning drudgery with one investment: Blue Wave Dirt Blaster. 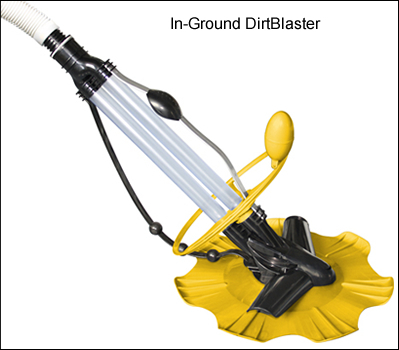 Because there is only one moving part, Dirt Blaster provides years of maintenance-free operation. Simply plug the unit’s hose into the pool skimmer and Dirt Blaster gets to work. Suction side pool cleaners like Blue Wave DirtBlaster Automatic Pool Cleaner™ are truly the most economical pool cleaning equipment to own and operate. With suction-side pool cleaners, an additional booster pump is never required. And unlike robotic pool cleaners, suction-side pool cleaners like Blue Wave DirtBlaster Automatic Pool Cleaner do not require additional electricity. Rather, they run off of the pool’s pump and filter system. Suction-side pool cleaners like Blue Wave DirtBlaster Automatic Pool Cleaner remove finer particles than a cleaner that uses a filter bag—such as a pressure-side (return-side) cleaner—so water gets cleaner without the pump and filter doing extra work. Suction-side pool cleaners also are easy to assemble and install. And since most suction-side pool cleaners have only one moving part, cleanup and service is a snap, and parts are relatively inexpensive and easy to replace. Everything required comes complete with DirtBlaster Automatic Pool Cleaner—there's no need for a booster pump. Suction-side pool cleaners like DirtBlaster Automatic Pool Cleaner do a great job of picking up dirt. Suction-side pool cleaners are easy to install AND maintain. Suction-side pool cleaners are the least expensive option in pool cleaning automation. WHICH TYPE OF AUTOMATIC POOL CLEANER IS RIGHT FOR YOU? When it comes to automatic pool cleaners, there is no "best" choice, simply because different pool cleaners suit different swimming pools. Depending on the type of debris a pool owner may encounter, one type of pool cleaner definitely suits the application better than another. Never trust suppliers that market pool cleaners in a "do all" fashion. Instead, know what types of pool cleaners exist and the types of applications they are designed for. Let's look at the types of pool cleaning units available today based on their features, functions, and corresponding benefits. Suction-side automatic pool cleaners use the suction from the pool pump to drive the cleaner around the pool. They essentially have a hose that connects to a skimmer box vacuum plate at one end and the pool cleaner at the other. Because suction-side cleaners are hydraulic by design, there is no steering mechanism; rather, they randomly follow the hose like a whip. Suction-side cleaners move along the pool floor, where debris is sucked up and trapped in the swimming pool filter. These types of pool cleaners are best suited, for example, to kidney-shaped pools with gradual corners, very few obstacles, and a rough pool surface like pebble. They are not designed for square pools, or complex-shaped pools. Suction-side pool cleaners also are the most popular automatic pool cleaners in use today. They can hook into the pool's suction system in one of two ways: plugged directly into the skimmer, or into a dedicated suction fitting on the wall of the pool. Older pools do not have the suction pool wall fitting. As such, the majority of suction pool cleaners are plugged into the skimmer. What drives the suction-side pool cleaner to move about the pool and vacuum as it goes is suction itself. This type of pool cleaner works as a moving filter, the bonus being that as the unit performs the cleaning process, it brings water in through the pool’s filtration system for faster water turnover in less time. The suction side actually refers to the pipes and fittings that bring water out of the pool to be filtered—that water being "sucked" out of the pool by the filter pump. As previously indicated, suction-side pool cleaners attach to one of the suction ports at the pool. Usually this port is the skimmer, or in some cases, the pool may have a separate vacuum port where the cleaner's hose can attach. With the hose attached and the filter pump running, suction is created on the underside of the cleaner. The pool cleaner moves around the pool with motion created by a device that gives a stop/start pulsing of water. 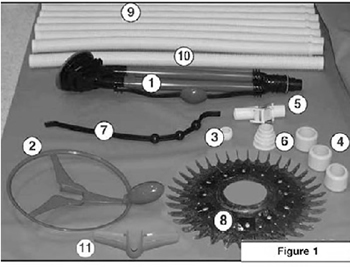 As the unit travels, debris is sucked up through the neck and then the hose, past the suction port, through the pipe, and stops at the filter pump strainer basket. Smaller debris passes through to the filter. Adjustments on the hose, the unit itself, and flow volume will create different cleaning patterns that maximize pool coverage. When it comes to scrubbing pool walls, some of the suction-side pool cleaners will agitate as they maneuver around the pool—creating a scrubbing action. As the cleaner is scrubbing and losing tiny particles, these are sucked down into the filtering system. This method removes much smaller particles than a pressure-side pool cleaner that deposits debris into a cleaner bag. No installation of additional plumbing or pumps is necessary, making a suction-side pool cleaner less expensive to install. Pressure-side pool cleaners (also called return-side cleaners) are another common type of automatic pool vacuums. Pressure-side cleaners operate on water pressure either generated by the pool pump, or via a dedicated booster pump. The pump pushes water to a fitting built into the side of the pool. A small hose—measuring about the diameter of a garden hose—is then connected to this wall fitting, with the other end attached to the pool cleaner head. The water pressure is used to drive the mechanics of the machine, as well as blow dirt and debris into a net debris bag or canister, depending on make and model of the cleaner. The water that is being pumped or "pushed" back to the pool powers these units, which have their own hydraulic power plant inside. Being on the pressure side, these units have distinct advantages. First, they are helpful in distributing clean, filtered water around the pool. Second, having their own debris bag or canister means they won't affect the pool filter system. Pressure-side cleaners, driven by adequate water pressure, move around the pool collecting trash into the debris bag. However, the down side to a pressure-side cleaner is that the net bag does not catch smaller debris such as sand and silt. Yet a pressure-side cleaner is said to clean a pool much faster than other cleaners simply because it uses the water pressure from the pool. The better the pressure, the faster it goes. The water pressure powers a couple of small jets that spray up and into the debris bag, creating a vortex that lifts the dirt and debris off the bottom of the swimming pool and into the bag. The efficiencies of pressure-side pumps make them ideal for pools with major leaf problems. Pressure-side pool cleaners that use a booster pump usually are more efficient at picking up larger debris than cleaners that operate on the pool pump alone. Pressure-side pool cleaners generally go for twice the price of suction pool cleaners—from $1,000 to $2,000 including pressure pump. They work well for both in ground and above ground swimming pools. Robotic pool cleaners differ from suction-side and pressure-side (return-side) cleaners in that they operate independently of the swimming pool filtration system. Robotic pool cleaners are electronic smart devices with computers and sensors that allow the cleaners to avoid obstacles in the pool. They run off electricity, using standard 240-volt power to drive the electric motors inside the machine head. A power pack is plugged into household current, the voltage is reduced to avoid electrical shock, and the robot is powered by built-in motors. Likely the most unique feature of robotic cleaners is the ability to mimic human cleaning. By programming an onboard computer to turn the device at intervals, a robotic pool cleaner can "learn" the shape of the pool to more effectively clean all areas. A robotic pool cleaner will maintain the entire pool without revisiting previously cleaned areas—something often seen in random cleaners. Many users say the true advantage of robotic pool cleaners is in the scrubbing action, achieved by brushes that actually scrub the pool walls and floor, and the tile lining as well. Pool owners are freed from the chore of walking around the pool, scrubbing away in a time-consuming pursuit. Robotic pool cleaners catch all the debris they remove in a self-contained filter. Filter bags capture all the trash, where it is stored for removal. Most robotic pool cleaners use filters capable of removing particles as small as 2 microns, which is considerably smaller than what swimming pool filters are capable of removing. By trapping debris in its own containment system, a robotic pool cleaner cuts down on the amount of pool filter cleaning or back washing required—ultimately conserving water. Robotic pool cleaners are the most efficient of pool cleaners, and also the most expensive—they range in price from $1,000 to more than $12,000.That's why experts say robotic cleaners are most suited to commercial pool situations where the pool needs to be cleaned as fast as possible and the price point is more in line with budgetary concerns. Clearly, all three types of pool cleaners will get the job done. Keep in mind that if a suction-side automatic pool cleaner is chosen, it will require backwashing or cleaning the pool filter more often as a result of the debris being sucked into the filter system. Since a pressure-side automatic pool cleaner works off the return line of the pool's circulation system, it adds clean, filtered water all around the swimming pool. And because a robotic pool cleaner is self-contained—that is, functioning independently of the pool's circulation system—the pool's filtration system may not need to be run as often. Another important factor in choosing an automatic pool cleaner is budget. As the pool cleaner increases in functionality, one can always expect an increase in price. Suction-side cleaners are generally the least expensive, robotic cleaners the most expensive, and pressure-side pool cleaners falling somewhere in between. Overall, a suction side pool cleaner like Blue Wave DirtBlaster Automatic Pool Cleaner is the most economical and energy-efficient way to keep a swimming pool super clean. DirtBlaster Automatic Pool Cleaner glides effortlessly throughout a swimming pool, cleaning and filtering without hard to use filter bags or baskets—a dream come true for pool owners. 1. Clean the pool, removing any debris that may inhibit DirtBlaster Automatic Pool Cleaner. 2. Backwash the pool filter or clean the filter element. 3. Clean out the pool skimmer basket and the pump's strainer basket. 4. Chemically balance the pool water. 5. Prime the vacuum hose by putting the end of the hose up to the pool’s return with the pump running. This will force water through the hose and purge out the air. Then keep the pump running until there are no air bubbles coming out of the end of the hose. 6. For pools with two suction lines (i.e., a main drain and skimmer or two skimmers) it is necessary to close off the suction line that is not being used for the cleaner. Do this by turning off the valve for the main drain, or use a skimmer bypass plate to restrict water flow. 7. Remove all obstructions from the pool—e.g., ladders, floats, toys, and other items—that could limit the ability of DirtBlaster Automatic Pool Cleaner to navigate the pool. 8. Never coil the hose when taking the cleaner out of the pool. Doing so may cause the hose to retain the coiled shape, which will hinder the cleaner’s performance. Ready for assembly? Click here for a complete guide to DirtBlaster Automatic Pool Cleaner assembly. Disassemble the hose sections and store in original box or lay out on a flat surface – NEVER store the hose in a coiled position. Store DirtBlaster Automatic Pool Cleaner so that the pleated seal lays flat, or remove the seal and store it in a flat position. You may need to attach hose weights to neutralize the hose’s buoyancy in the water. With the pool cleaner turned off, the hose balance is correct when the pool cleaner’s seal rests flat on the pool floor and the main body makes a 45 degree angle with the pool floor. Your Dirt Blaster pool cleaner will produce the best results when the hose neither weighs down or pulls up the unit. Typically one weight is needed, placed 4-12" away from the body’ swivel head. Typically all 3 weights are needed. The first should be placed on the first section of hose between 4-12" from the body’s swivel head; the next 2 weights should be positioned 6’ and 10’ from the body respectively. HOSE IS TOO LIGHT – if the hose rises toward the surface at an angle greater than 45 degrees, move the weight closer to the cleaner. HOSE IS TOO HEAVY – if the hose sags downward at an angle less than 45 degrees, move the weight away from the cleaner. Skimmer or pump strainer baskets are clogged with debris. Vacuum flapper clogged with debris. Turn cleaner over and remove debris. Click here for further instructions. Automatic regulator valve stuck in open position. Remove obstruction or replace if broken. Crack or air leak in hose. Excessive debris on pool floor. Remove by manually vacuuming or with leaf rake. Suction coming from multiple ports. Close all suction lines,except for the line to which the cleaner is attached. Automatic regulator valve stuck in closed position. Clean automatic regulator valve port and hinge. Automatic regulator valve not installed. Insufficient number of hose sections. Return flow interfering with cleaner. Make sure eyeball diverter is installed and facing down. Add or adjust hose weights as needed. Contacting an obstruction in pool. Remove hose sections one section at a time. Sometimes we all need a little help clarifying pool product lingo. Here we present six Frequently Asked Questions regarding pool cleaning equipment and care. 1) The suction-side pool cleaner is moving very slow? What could be the problem? It is advisable to check the pump basket for debris, ensuring that the filter is clean and water is flowing properly. Also check the throat of the pool cleaner for any obstructions. Obstructions also may be found where the hose attaches to the suction line. Check hose for splits, obstructions, or holes. If a pool contains a lot of leaves from surrounding trees, an in-line leaf trap is recommended for use with the suction cleaner. 2) The suction-side cleaner isn't cleaning the entire swimming pool. How can this be improved? First off, the hoses may be too short. Another common cause is that the pool cleaner itself may be following the flow pattern of the water in the pool—in other words, strong flow from wall return jets will push the cleaner into a pattern. The remedy is to adjust the return port wall fittings, or add wall fittings to the return ports. It helps to point the fittings down or at a downward angle. If the pool doesn't have wall fittings at the return ports, there are alternative wall fittings made by the manufacturers to divert the flow. Quick tip: Always rotate the wearable parts on the cleaners and replace those wearable parts when needed. These parts will prevent the need to replace more expensive components. 3) The robotic pool cleaning unit will not move. What is stopping it? Also check the electrical outlet with another electrical appliance to ensure power is available. If the power is available and the fuse is good, try wiggling the power cord plug from the unit to the transformer. Older cleaners may begin to short out at the plug; a new plastic female plug may be required. Inspect the unit itself while it is partially underwater. Is the pump motor receiving power? Is there water gushing out of the top of the unit? This would indicate that power is reaching the unit. Additionally, is the pulley on the drive belt side turning? If not, this may indicate a shorted motor, or a corroded drive T, which would also require motor replacement. Quick tip: Always ensure that belts tight and in good repair, as they often become stretched and weaken over time. If the belts are "skipping" and are not locked into the grooves of either the drive pulley or the wheel tubes, they may require replacement. Check that the wheel tubes are in proper position with bushings in place on either end. If the tubes are not straight, the drive belts will not be tight. 4) The robotic pool cleaner does not pump. What is the problem? If the unit moves, but does not pick up any debris, lift the unit up near the surface of the water. Does water gush out of the top? If not, the pump motor may be shorted. Unplug the unit and pull it out of the water. Remove the vent cap on top of the unit and check that the impeller does not have string wound around the base. Turn the impeller by hand to check spin. Plug in unit and check spin. If there is no spin, the pump is probably shorted. Another reason may be that the pump motor is not working properly is if the unit won't climb the walls very far before falling off. The pump motor provides the suction it needs for climbing. 5) Should a pool be brushed regularly? Yes. A pool brush normally is attached to a telescopic pole, and is most commonly used to brush algae off of the walls. Brushing a pool will keep dirt from occupying the small pores and starting small organic farms. Steel bristled brushes—called algae brushes—are very effective on algae. However, do not use a steel brush on a vinyl-lined pool. Done regularly, brushing reduces the time spent vacuuming. Brush from the shallow end toward the deep end in overlapping strokes. Circle the pool towards the main drain, and much of the dirt will be swept up into the filter in this manner. 6) It takes too long to scoop out leaves from the pool. What is the fastest and best way to do this? Using a leaf skimmer to scoop out the leaves will slow the process dramatically. It is best to first use a leaf rake, which is much like a leaf skimmer but has a deep bag-like net instead of a flat net. A leaf rakes holds many more leaves with each scoop. Also, a leaf rake allows the water to pass through much easier when it has leaves in it than a leaf skimmer does, thereby preventing the water wave that results in front of a leaf skimmer from pushing the leaves away from it. A leaf rake also is much easier to use when scooping leaves from the pool bottom. When scooping the bottom, extend the pole out as far as possible, face the Leaf Rake back towards you, and pull towards you. This will scoop up the leaves as you pull. Quick tip: The best way to keep leaves out of a pool in the first place is to empty the skimmer basket(s) often. Rather than letting the skimmer basket fill up, dump the basket as needed. This may be several times a day, but it's still a lot easier than getting leaves off the bottom. For pool systems with pumps on a timer, run it manually so the skimmer(s) catch more leaves.